Custom hotel room signage can be an effective way to set your hotel brand apart from your competition. 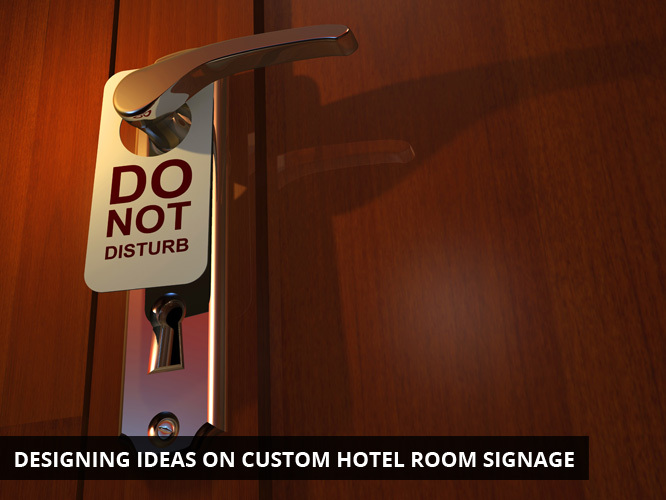 Before you can design custom signage for the rooms at your hotel, there are some important considerations, including the types of signs you will need, where you place the hotel signage, and legal requirements of the signage. Under the ADA, all hotel signs must be made without the use of reflective materials, and must be made with letters and numbers that contrast with the background. To ensure the rest of the signage in the hotel does not clash with the ADA design requirements, ensure the other signage is made with either the same or a complementary design. Signage placement is critical to the overall design of the room. Certain signs should be placed in obvious locations, i.e. the room number sign needs to be either on or to the right or left of the door to the room; directional signage outside the room needs to be placed according to the direction of the sign and what it is indicating. Other signs, such No Smoking signs can be placed either on the door of the room, or on the wall inside the room; the check-out time sign could be placed on the night stand with any tent signs. Regardless of placement, make sure the sign is in an area where it is easy for the hotel guests to see, and where the design will not blend in too well with other elements in the room. While you want the placement to coordinate with the overall room design, you don’t want the sign to fade into the design to the point where it is not clearly visible. Signs in handicap accessible rooms must be placed on the wall to the side of the door, and centered 60 inches above the floor so they can be easily spotted by people who are blind or who have low vision. Think about what the room looks like – and make sure the new sign design works well with what’s already in the room, including: bedding, wall color, flooring, other signage, lighting fixtures, etc. If you are doing any sort of remodeling work on the room, factor the signage designs into the overall new look. Also consider the look and feel of your brand, as well as current logo, font, etc. When designing the signage, do not forget to factor those design elements in, as well. Though not always possible for certain signage, tie all the elements of your design together by using your hotel’s color scheme as often as possible. If you are re-working your entire brand identity, as part of a rebranding or a merger, build signage requirements into the brand identity package, or include other elements of the brand identity for your designer when working on your custom signage. If you have an idea for your custom sign design, unless you are a skilled designer yourself, it is a better idea to hire a professional designer to craft the sign design for you. In many cases, signage production companies also have a design team on hand who can work with you to fine tune your concept into a workable design. Skimp on the design, and you could end up with inferior quality signage that reflects poorly on your brand. When designing custom hotel room signage, you do have some legal restrictions to consider, but overall, you have a great deal of freedom to make signage that fits in well with your hotel theme and decor. When meeting with your designer to discuss concepts, ask about the number of mockups you’ll receive. Do not feel rushed to complete the design process – as this is the critical step to ensuring you end up with a beautiful sign that gets customers talking.